In the fall of 1948, Harry Truman was president of the United States and enrollment at Arkansas State College was 1,093 students, many of whom were World War II veterans and spouses. A young educator named Mildred Vance joined the faculty that year, supervising kindergarten classes in the Demonstration School, a public K-12 school operated by the college as an extension of its program in education. This week, more than 54 years later, she told the College of Education she has decided to retire from full-time service to Arkansas State University. For Dr. Mildred Vance, the achievements, the accolades and the dedication have been remarkable. Extraordinary adjectives are not extraordinary at all when describing her and her career in education, according to her professional colleagues and friends. Legions of her former students would surely agree. "I’m happy for your wonderful career and the many contributions you have made here," Dr. Les Wyatt, president of the university, wrote to her. "You have touched many lives, including mine. Thanks for all that you have meant to all of us." The dean of the College of Education, Dr. John Beineke, praised Dr. Vance as an exemplary model for the education of teachers and children in this state and across the nation. "Her work in Arkansas, Michigan, Texas, and Tennessee over the past 50 years has consistently been a beacon for best practices for educators and the children in their classrooms," he said. "Dr. Vance has been generous and supportive of me as dean with her time, advice, and counsel." The chair of the Department of Teacher Education, Dr. Veda McClain, who came to ASU in 1997, was quickly impressed with her new colleague. "l soon realized after getting to know Dr. Vance that here in our midst was a treasure of wisdom and knowledge, not only about preparing teachers, but about life and the world in general," she recalled. "Dr. Vance continues to display an open mind about interacting with individuals from diverse backgrounds and about exploring new and different places. "She always talked about preparing our students to live and teach in a global society. As a result of that notion, Dr. Vance challenged our students to think beyond the confines of the walls at ASU and those of their communities. We will miss her warmth, her kindness, her love for teaching and learning, her faithfulness and dedication to her students, and openness about the world." Over the years, recognitions have come her way many times, in many ways. One of the most recent major honors occurred last year, when the ASU Alumni Association recognized her as a Distinguished Alumnus. Selection is based upon professional achievement, community service and service to ASU. In a profile published in Voices, the ASU Alumni Association magazine, she recalled the joys of teaching kindergarten and the professional development that experience offered. "Teaching kindergarten, I learned how to respond to a person in a very positive way and how to help them become the kind of person they wanted to be," she said. Most of her career was spent teaching students how to be effective teachers. "Teaching is the greatest profession," she asserted. "Without teachers, there would be no other professions. Teaching encompasses the imagination and commits one to the pursuit of excellence in yourself and your students." Her love of teaching, the College of Education, and ASU inspired her to write a book, "Reflections: Fifty Years of Teacher Education at Arkansas State University," which was published last year. In the book, she chronicled the development and success of ASU’s teacher education program, which produces more teacher education graduates than any university in the state. In 1996, the Southern Early Childhood Association, which involves professional educators from 14 Southern states, named her SECA Outstanding Member of the year in recognition of her contributions to SECA and to the field of early childhood education. The Eta Delta chapter of Kappa Delta Pi, an international honor society in education, presented her in 1993 with the Eugene W. Smith Point of Excellence Award and gave tributes during a Convocation of Scholars Week banquet. Mayor Hubert Brodell proclaimed "Mildred Vance Day" on May 8, 1989, in honor of her commitment to early childhood education and because she has "made such a difference in the lives of citizens in Jonesboro, in Arkansas, and the Mid-South region." The native of Sedgwick, where she still lives, received her bachelor’s degree from what was then Arkansas State College in 1946, then taught in public schools before joining the ASC faculty in 1948. Her other prior experience included the Federal Bureau of Investigation in Washington and the American Red Cross in Illinois. While continuing to work at ASC, Dr. Vance continued her own education, earning a master’s degree at George Peabody College for Teachers at Vanderbilt University in Tennessee and her doctorate at the University of Texas in Austin. She was promoted to professor of education in 1959. 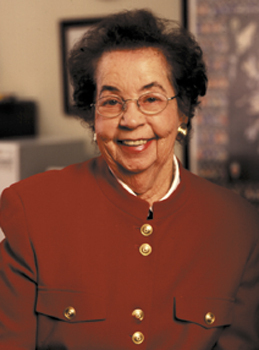 During her tenure at ASU, Vance designed and developed three early childhood degree programs for the College of Education, two of which are at the master’s level. She was the first regional training officer for the Head Start program in Arkansas and one of the first in the nation. She wrote the successful Title 20 grant in 1977 for the ASU daycare center. In 1978 she was named the first recipient of the ASU Outstanding Faculty Award for Teaching and later served as chairman of the President’s Fellows. Her research and articles have been published extensively in professional journals and she has made numerous presentations to area schools and to regional, state and national education associations. She has served on numerous committees and organizations throughout her lengthy career, including serving as president of the ASU Faculty Association. Vance is a member of many professional organizations including the World Organization for Preschool Education, the National Association for the Education of Young Children, the Southern Early Childhood Education Association and the Arkansas Early Childhood Association. She also is a member of Phi Mu Fraternity, Kappa Delta Pi, Kappa Delta Gamma, Phi Kappa Phi and Phi Delta Kappa.